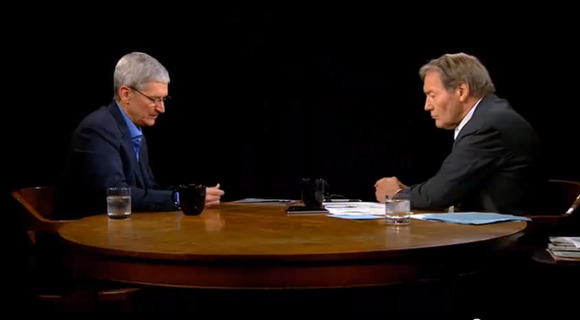 Apple CEO Tim Cook doesn’t speak publicly often outside of events and the company’s quarterly earnings calls, so it was a special treat to watch his interview with Charlie Rose this weekend. We’ve put together edited highlights from his first hour chatting with the ABC talk show host about Apple’s new products, the Apple TV, Steve Jobs, and the future of the company. We could have done a larger iPhone years ago. It’s never been about just making a larger phone, it’s about making a better phone in every single way. And so we ship things when they’re ready… This phone—now is the time for it. The philosophy [of Apple] has always been to be the best, not the first. If you look back in time at Apple, the iPod. The iPod was not the first MP3 player. It was arguably the best, and arguably it was the first modern one. But not the first. The iPhone was not the first smartphone. BlackBerry was shipping phones, Palm was shipping phones. iPhone was the first modern smartphone. And then if you look at iPad—tablets were shipping a decade before. And yet, iPad arguably was the first modern tablet, and the first one that met any level of commercial success. To wear something, it had to be incredibly personal. It had to reflect your taste and express what you wanted to express about yourself. It’s sort of like your clothes and your shoes: You’re not going to wear the same thing everybody else does. We recognize that technology itself isn’t sufficient, that it had to have a style element. It had to be something that you’re proud of wearing. I mean, this is connected to your body... It makes [the computer] very personal. It requires an iPhone, yes, because they’ve been designed to work together… however, if you go for a run, and you don’t want to carry your iPhone, music is also in your watch. And so with a Bluetooth headset, you can run and listen to your music without your iPhone. With health care, there is a wide-open field to make some really profound contributions… So this is yet another way to begin to build a comprehensive view of your life, which should empower you to take care of yourself over time, and when you need help, it empowers you to take certain data to your doctor to get help from them. All while guarding your privacy, so that nobody’s getting the data if you don’t want them to have the data. Nobody’s sharing the data if you don’t want them to share the data. And, no, we’re not keeping it. As it turns out, people love their credit cards. I don’t know what credit cards you have, but many people love their credit cards, because they might love that you collect airline points, or there’s something about it that’s sticky. We looked at the industry and we said, y’know, people like that part. And so we’re about making the user’s life better. Making the experience better. We saw all the mobile payment stuff that had been done as none of it was making anybody’s life better. It was more about creating a business model for someone else to make money. We started with the user, and we said, “What do they really want?” Well, nobody wants to carry a wallet. You don’t want another thing that you have to remember to put in your pants when you walk out the door. You don’t want another thing to lose. You don’t really want this card with exposed numbers on it that has a huge security risk on it. We fixed the security issue. Our system is much more secure than the traditional credit card system is. We kept the thing the people liked, which is they do love their card. And we said “We don’t want any of this data.” So we’re not doing what other companies are doing. We don’t want to know what you’re buying. We don’t want to know where you’re buying it. We don’t want to collect all this stuff on [you], Charlie. I don’t want to know where you’re spending your nights. And so we firewall all the stuff, we don’t keep it, it’s not on our servers. And so we kept what’s great, and fixed what wasn’t. He’s in my heart, and he’s deep in Apple’s DNA. His spirit will always be at the foundation of the company… His office is still left as it was… his name is still on the door. And he told me, he said “I’ve been thinking a lot; Apple’s never had a professional transition in CEO, I’m determined that we will have one now; I want you to be the CEO.” And honestly, I didn’t see it coming. I know you look at me with disbelief, but you can say I was in denial or whatever, but I thought—I felt—that Steve was getting better; he was still at home, but I felt that he was getting better, I was seeing him regularly. And I guess at the end of the day, I always thought he would bounce. He always had. He had had some incredible lows in his health and had always bounced, and I always believed he would. And so it took me a little by surprise for that. I mean, he had talked to me about being CEO before, and so I always knew it was his long-term thinking… to become the CEO. But not that specific moment. And he said, “Well, I hope you’ll ask my opinion on some things!” [laughs] But he… I thought, Charlie, on that day, that he would be chairman for a long time. That I’d be CEO for a long time. And that we would continue to work together. He knew when he chose me that I wasn’t like him. That I’m not a carbon copy of him. He obviously thought through that deeply, about who he wanted to lead Apple. And so that I have always felt the responsibility of. And I’ve wanted desperately to continue his legacy. The Apple I deeply love. And so, from the onset, I wanted to pour every ounce that I had in myself into the company. But in terms of being everything he was, I never had that objective. I’ve never had the objective of being like him. Because I knew, the only person I can be is the person I am, right? I’m not an actor. I’d be terrible in Hollywood. And so that’s what I’ve done. I’ve tried to be the best Tim Cook I can be. I think each person… if you’re a CEO, the most important thing, to me, is to pick people around you that aren’t like you. That complement you, because you want to build a puzzle. You don’t want to stack chicklets up and have everyone be the same. And so I believe in diversity with a capital D. And that’s diversity in thought, and diversity in any way you want to measure it. The people that surround me are not like me. They have skills that I don’t have; I may have some that they don’t have. What we do as a team, collectively, we’re able to do some incredible things. And it’s because we collaborate. And I see one of my key things in life is to make sure that we collaborate at an incredible level. Because we run the company functionally, we’re not like the typical big company that has n-number of divisions, and n-number of P and Ls [income statements]. Everybody is a functional expert, and then we collectively, to get things done, we work together as a team. Because the work really happens horizontally in our company, not vertically. Products are horizontal: It takes hardware plus software plus services to make a killer product. I think that the reality is that Apple has always had incredible contributors at very high levels. Jony [Ive, SVP Design]’s been there forever and contributing at an incredible level, as has Craig [Federighi, SVP Software Engineering] and Jeff [Williams, SVP Operations] and Dan [Riccio, SVP Hardware Engineering]. And you just go around the table. We have a new CFO now [Luca Maestri]. This group of people—and we’ve recruited Angela [Ahrendts, SVP Retail and Online Stores]. You know, Angela now runs retail, Angela Ahrendts, and she is fantastic! This level of people are capable of doing incredible things, and it’s a privilege of a lifetime to work with them. Well, I’m the dirty one. And you have to block the noise. The question, I think, is did I have doubts, and the answer is no, and did the executive team have doubts—I think you can see in our products that we were all betting on each other in a big way. Are we more open, yes. I think IBM… that’s a great one to talk about for one because I think it’ll give you an insight into how we look at things, and this is probably different than the past. I didn’t want to forget it, because this is a way to enrich people’s lives in a big way, to change the way people work, I mean most of our life is spent working! And certainly our apps are changing the way I work, but I’m not seeing it as much in other places. [IBM has] things that we don’t have. They have deep vertical knowledge of many different verticals, right? They have a huge sales force. IBM brings significant enterprise knowledge to the table. We bring the products that enterprise wants, and so we have something they don’t have. And we also don’t compete on anything. To me, this is the perfect marriage. There’s no friction, there’s just “We have what they need, they have what we need; together, we can provide something to customers that is blow-away.” And so IBM is in the process, with our help, of designing many different apps for many different verticals, from banking to all the different financial services, to pharmaceutical, to aerospace and manufacturing, and so on and so forth. And they have the go-to market that we don’t have. This is an area where I think that everybody’s going to win. We’re going to win, IBM’s going to win, and more importantly than both of us—the customer’s going to win. In Beats, what we saw was several things. We saw talent that I was super impressed with; Jimmy and Dre are off the charts creative geniuses. They also had teams underneath them that I really liked. Jimmy has a deep knowledge of the musical industry; Dre knows artists. Dre is an artist. And they had started a subscription service. And the subscription service, well, some people think that they’re all alike. Let me tell you, I went into the thing skeptically, like I should… not into the acquisition, into their service, because Jimmy had told me how great it was. … I felt that we could get a subscription service, we could get incredible talent, and that I think we could all put our heads together and do some things that are beyond what either of us are currently doing, and we could get a fast-growing business.